* A 35-year-old healthy firefighter died 500 yards before the finish at the 2011 Chicago Marathon. 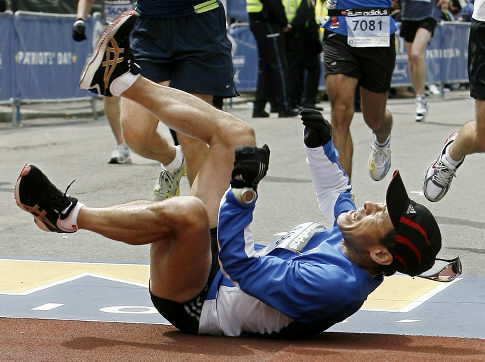 * A 33-year-old male running a half-marathon dropped at the 12-mile mark, 3:10 into his race. The morning of the race, he had drunk two energy drinks and a grande coffee, and used two caffeinated gels. Cardiac catherization revealed a small lesion (less than 20%) but otherwise clean coronaries. * A 42-year-old woman running a marathon dropped at the 24.5-mile mark, 4:10 into her run. She had drunk two large coffees and had three caffeinated gels. Her cardiac cath also showed clean coronaries. * A 26-year-old male also running a marathon dropped at the 25.5-mile mark, 3:25 into his run. He had taken two caffeine pills plus coffee the morning of his race, and also had clean arteries on cardiac cath. More cases were discussed. We also noted that the press always goes to the deaths at these events, not to the many more numerous successful resuscitations. And with these successful resuscitations, we can interview the patient and find out what they did that might have contributed to their collapse.